A Flavors & Fragrance company needed confirmation that a manual valve was in the correct position before starting a batch filling operation. They required the valve to have no cavities where material could become trapped. The Assured Automation BET Series Butterfly Valve offered the perfect solution. 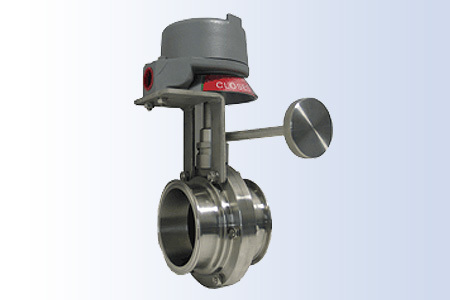 The custom manual valve is a 316SS sanitary butterfly valve, triclamp end connections, with PFA seats. The Assured Automation YE limit switch was selected, since it features and explosion proof enclosure Cl1, Div1&2. It features 2-SPDT mechanical switches, an easy screw off cover, touch set cams, and a visual OPEN/CLOSED indicator. The feedback switches confirmed valve position and provided local visual indication of the valve position. This entry was posted in Custom Projects and tagged Butterfly Valves, Limit Switches, Manual Valves, Stainless Steel Butterfly Valves, Stainless Steel Valves, YE Series. Bookmark the permalink.